The 16610 model of Submariner Date was discontinued in favor of the 116610 model Submariner Date, which is often referred to by its most notable feature as the ceramic bezel Submariner. So when discussing features, we should start with the bezel. This is the most exciting and visually accessible difference between the two models. The ceramic bezel (officially Cerachrom) insert is certainly interesting as a material. It is for most purposes scratch-proof unlike the 16610 aluminum inserts. I say ‘for most purposes’ because if you hit it hard enough against the right material, you probably could scratch ceramic, but you’d be more likely to shatter it. Now, if you did shatter it, it would likely be very expensive to replace compared with the aluminum bezel insert which can be replaced for about $200. I have yet to see or hear of a broken ceramic bezel, but we have seen a considerable number of aluminum inserts that have needed to be replaced within a few years, so I think the ceramic is a true advantage for most owners. What I do not see pointed out frequently is the improvement in the actual mechanism of the bezel. 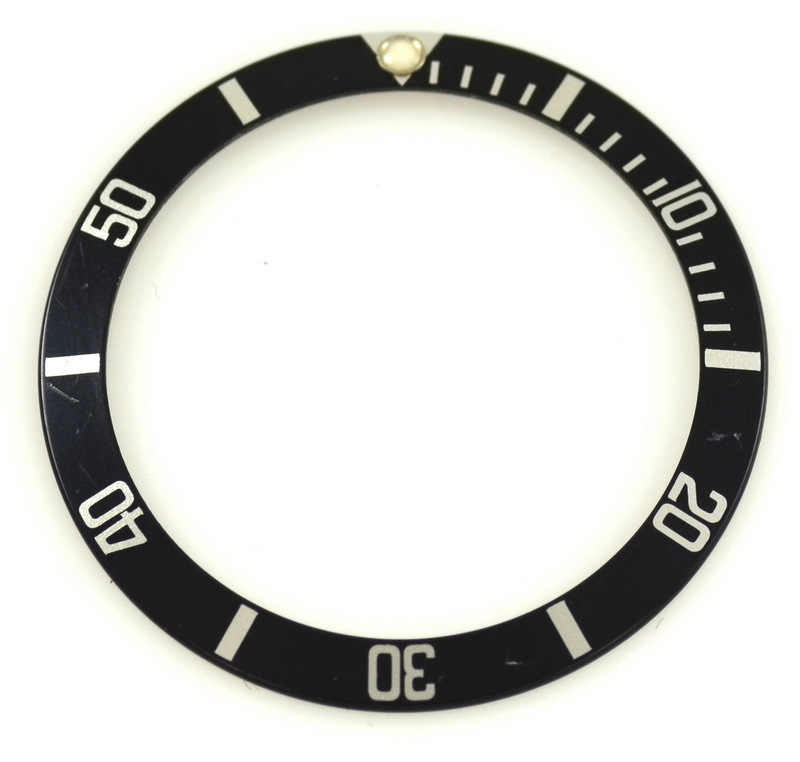 In the 16610, a single click-spring controlled the bezel’s rotation and it could become stuck or rotate freely. It was also difficult to seat the bezel accurately, the bezel might be a frustrating half tick off of true centered after being replaced during service. 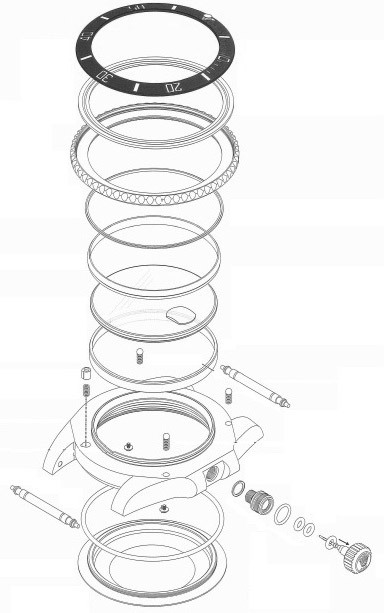 The 116610 uses four click-springs set into the case. This results in a perfect alignment of the bezel markers and a consistently smooth and solid turn. The next most noticeable feature is the luminous which has an obvious size difference (so-called Maxi dial) and a less obvious color difference in that it glows bluish-green in the dark instead of green. 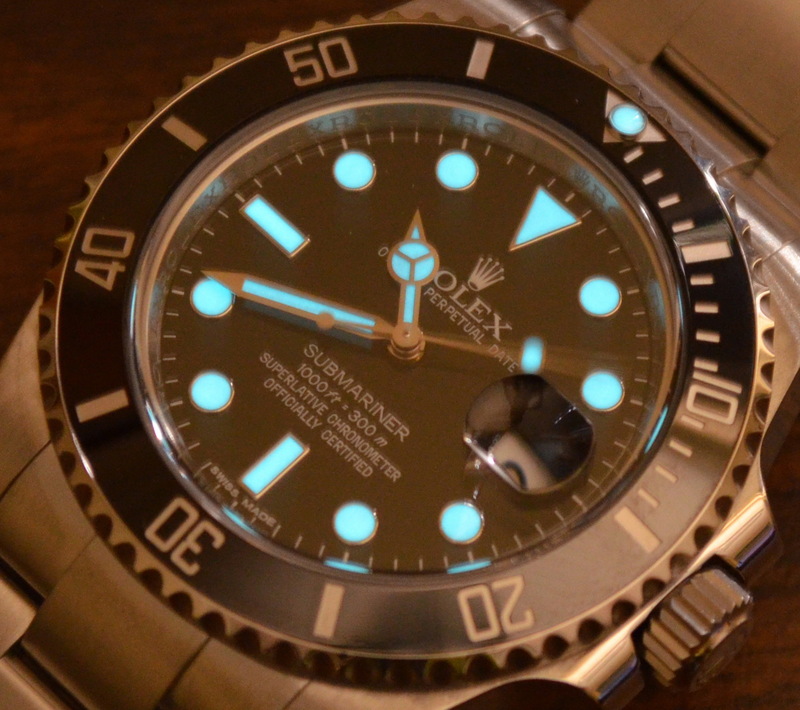 Rolex terms the blue luminous as “Chromalight”, although we suspect that it is the same SuperLuminova material that Rolex has been using for years, just with an alternate color. The particular color of blue-green is one that the dark adjusted eye is most sensitive to. So whether or not it is objectively brighter, your eyes are more sensitive to that wavelength and you will perceive it as brighter. 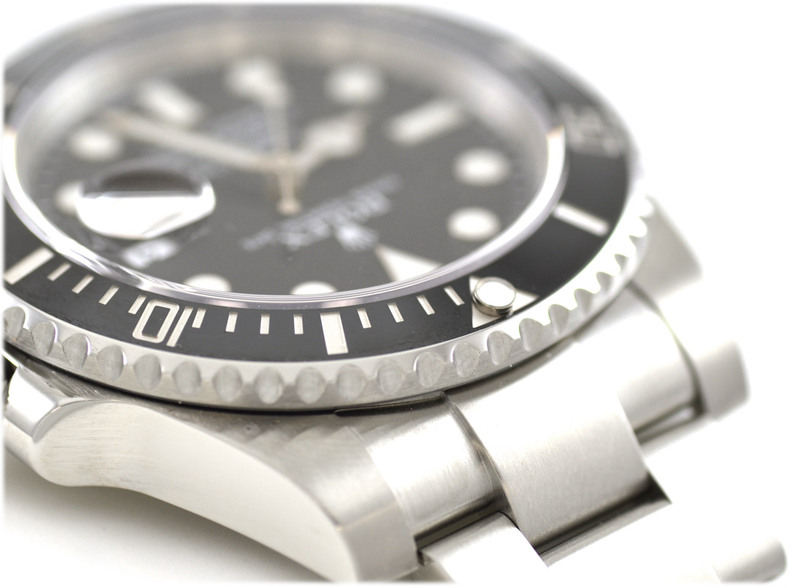 Ostensibly the 16610 Submariner and the 116610 Submariner measure the same 40mm width. However, the 116610 will appear larger on the wrist than 40mm and many who would think a 40mm case too small, find the 116610 to be a good fit. There are two major reasons for this. The first reason is the crown guard, which is nearly twice as wide on the new model. This gives the impression of a wider case. The second reason is the lugs. The lugs are nearly twice as wide on the 116610 meaning the case tapers down much less. So instead of measuring 24mm at the base of the lugs, the measurement is 27mm. The links of the new Submariner date are entirely solid. This is difficult to see without removing a link, so we’ve done that in the photo below. 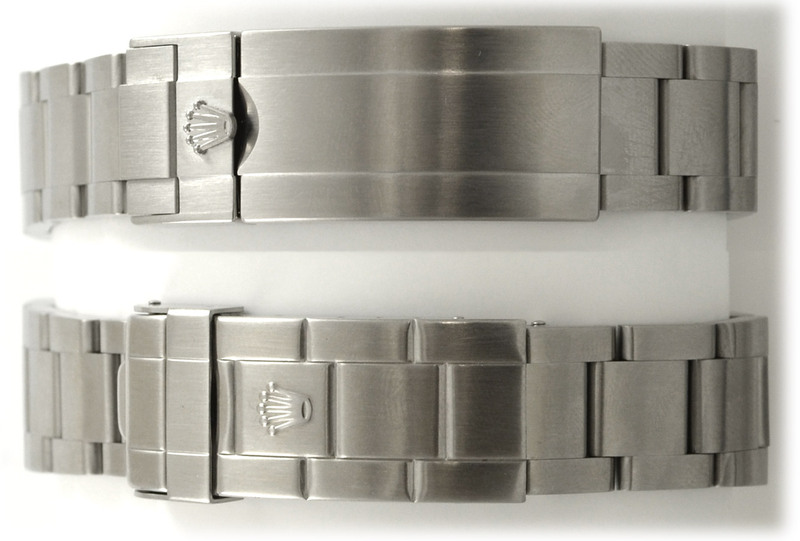 This gives the overall bracelet a little extra weight but likely removes the issue of bracelet stretch that has been all too common on Rolex bracelets prior to this. The Glidelock clasp is a truly noticeable and great improvement. Not only does it give a greater degree of precision when micro-adjusting for fit, it also makes it easier for owners (as opposed to jewelers) to perform the task of adjusting the bracelet themselves. If you live somewhere hot like we do, you’ll notice your wrist swells in the summer, so an easy micro-adjustment is a godsend. Overall, the new 116610 model presents a series of strong, clear improvements over the earlier 16610 model while remaining visually true to the classic form. We try our best to always have a selection of Rolex 16610 and Rolex 116610 Submariners in stock, however they are great sellers and tough to hold on to. If we don’t have the steel models, we always have some two-tone and solid gold Rolex Subs listed. Both great timepieces. I personally prefer the older version’s case; the new models, save the 42mm Exp II, are too blocky looking. My ideal watch is the older version Sub LV, replacing the green aluminum bezel insert with a black one. I love the maxi hour markers and larger hands. I cannot argue with the bracelet and clasp improvements However. 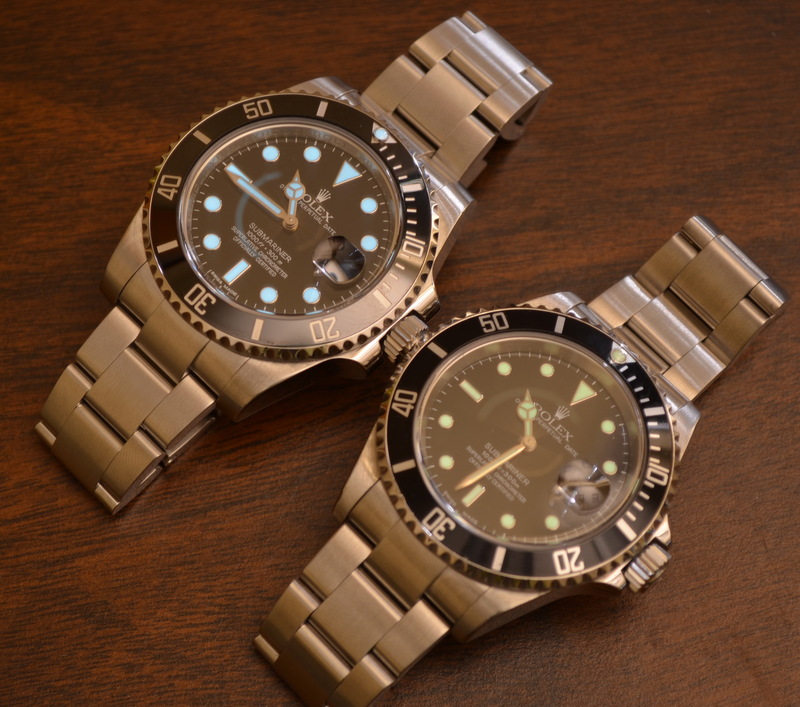 Very interesting comparison of both Rolex watches, Submariner 116610 and 16610. I owned the new submariner for one week and really did not like it. Yes there are some new features, but I found the watch to be heavy and bulky. I did not like how it fit my wrist compared to the older model which I also own. Fantastic post! Really well done. I tried both models on and also found the new submariner too bulky and the transition from the case to the band to have too much of a step off. No question I prefer the former model and ended up purchasing an M serial number 2008 submariner and absolutely love it.. I just received my 116610; really like the ceramic bezel: its deep ebony black color is enhanced (my speculation) on the ceramic material. I’ve owned mine for its inaugural 24 hours, and it’s fun to check the time. Very informative article, and I appreciate all your insights. I’m actually in the process of deciding which rolex submariner model to purchase. Great article! Very helpful and informative. Thanks a lot! I’ve purchased my 116610 several months ago and have taken it off since. The watch is a tank, and can take on any normal daily bumps I throw at it without any noticeable wear. I love it’s blue lume at night, its much clearer and vivid than my Omega sea master. I can also adjust it’s Gridlock bracelet subtly throughout the day, as my wrist requires. I’d highly recommend this watch. While I own the previous gen, it’s extremely clear that the new model is better in every aspect. The lug issue isnt really an issue, as sport watches are expected to be bigger over the past decade. The 116610 also features an anti-glare date bubble (those of us with 16610 models know the benefit of this). Owned a Milgauss and really struggled to `love` it. Good watch but couldn`t get into it. The 16610 on the other hand is next I think but it looks like Ill be buying used. People love to hate Rolex. It’s like, if you work hard, look what you get. Plus ever notice jewelry stores and pawn shops sell used Rolex, but not timex, cassio, etc.? 114060, no date, maxi dial, greyish ceramic bezel = Throwback to the 5513. One of the greatest watches of all time. very helpful review. Got my very first Rolex though its just a 2nd hand Submariner 16610 ( tnx to this, ive known that mine is a 16610 ). Great comparison!!! One thing you forgot to mention is the laser etching of “ROLEX” all throughout the rehaut (inner bezel) on the 116610. On the 12o’clock position is a Rolex crown and on the 6o’clock position is the random serial number. I just purchased the new sub and absolutely love it. So everyone is clear on the Raihans post – The later 16610 also include the inner bezel laser etching. I own many Rolex watches, including a daytona and 3 Sus, the 16610 with date remains my favorite. Does the new style braclet 116610 fit and match color wise on the older 16610 sub? Yes – the material(s) is the same, 904L stainless steel. When did they start making the 116610? The 116610 with ceramic bezel was introduced in BaselWorld in 2010. It was available for purchase in Summer of 2010. Can you buy and retro fit the ceramic bezel to the older model? Sorry, they cannot be retrofitted. They use a completely different rotating mechanism. Great article. Looking to purchase first Rolex. I have decided on the Submariner . Cannot decide whether to purchase one with Date or without the date. I prefer the look without the date. However, interested in knowing which would have a better resale value in the long term. That would be a factor in my final decision. Any input would be appreciated. I don’t find much difference in resale value, relative to the original retail, in the recent ceramic models 114060 (no-date) and 116610 (date). Beyond the date, they have identical features. However, in the prior non-ceramic models (14060 and 16610) you will find differences in features beyond the date, which have given the 16610 a slightly stronger resale. 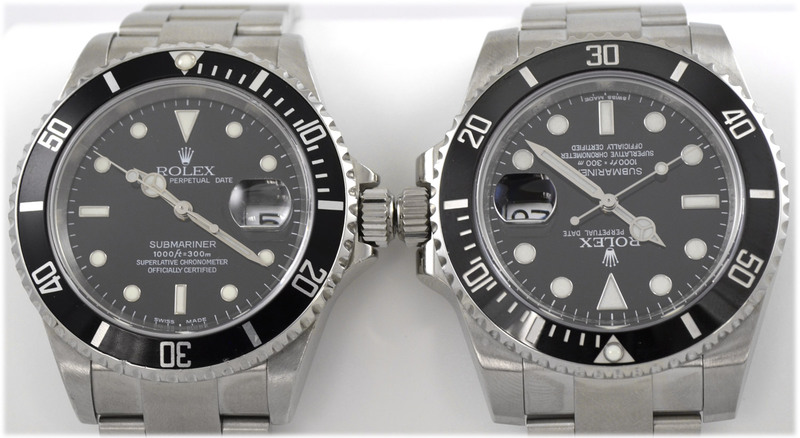 What is the difference between Rolex Submariner 116610 and 116610 “LN”? Any idea please, thanks. They are the same. The LN means the watch has a black bezel. Since this is the most commonly found Submariner, the LN is often omitted. Can someone please inform what the measurement is of a lug end/tip on the 16610. The measurement is 47.5mm from lug tip to lug tip. Nice piece, good guide for newcomers. Just picked up a 166100, 2001, clean. Very pleased… The Sub is easy to love, you’re so used to seeing it. It’s an icon, even the Rolex haters have to agree. I waited a while to get mine – I have three Omegas 8500 PO, SMPc and Speedy – but if you collect, you’ve gotta have a Sub and Rolex is an immense company, with history and an unequalled focus on organisation and attention to detail. I honestly think the ‘new’ 116610 makes a great choice for the ‘one watch’ person. But if you collect, a good 166100 is all you’ll ever need. What are the model numbers of the old submariner no date and new submariner ceramic no date? When did the ceramic no date become available? Thanks! They are 14060M and 114060 respectively. The 114060 was announced at Basel in 2012. I bought a new stainless steel and yellow gold Submariner 6 weeks ago from an authorized Rolex dealer. Model number is 116613360B9720. The 3 dots on the crown are small-big-small. My Internet research indicates the dots should be small-small-small, and that the white gold Submariner is small-big-small. What am I missing? Earl, your internet research is not wrong, it is just not complete. Rolex stopped using gold capped crowns relatively recently. Now that the crowns are solid gold, the small-big-small dot pattern is correct. It is simply an indication that you have a newer model. Excellent comparison. Thanks. See my replies above. Owning several Rolex and Omega watches, I’d like to see Rolex make an improvement to changing only hours, like Omega offers. I travel through time zones and it’s much more convenient just changing the hour hand than having to reset the time which is precisely set. My Submariner 16610 is 17 years old and looks like the day it was purchased. I did have the Submariner serviced once (four years ago) for $675. Great job! I will buy a sub next year. I love your comparison. I am now sure that the new sub is the right one for me. Not sure about the date yet, but I am giving myself a year to figure that part out. I am only going to spend the money once on this item and it “must” be the right one. Awesome comparison. Been contemplating new sub with new GMT. Recently I’ve gotten an interest in the older subs: 6536, 6538, 5512, or5513. I’m from london but work in Dubai and have noticed Rolex are cheaper here to buy……perhaps tax free. Another great comparison. I don’t think you touched on the difference in size in the hour dots and watch hands or maybe I just missed it. Anyway I have an older tritium 16610 and prefer the smaller hour dots to the larger ones. I would prefer the new adjustable bracelet however I would never swap out the original as I think that an original timepiece is more desirable. How often should I have the service to the watch performed? I have owned the watch for four years now and have never had the service done. Michael, I usually suggest service intervals of four to seven years for your average mechanical watch being worn daily. Much longer (even ten years) is not unusual for a good Rolex. Frequency of wear has an impact on service intervals (much like miles driven in a car) so there is simply not a hard and fast answer. If the watch is keeping time within 10 seconds per day and holding its power reserve while off the wrist, then I don’t see much reason for you to service it quite yet. Hello just wanted to clarify is the 116610 the same watch as the 114060 ?? Obviously with one of them with date and the other without right?? I love how how the new they made the newer one look a little bigger with the lugs and crown guards. Basically my question is the 114060 the same dimensions as the 116610 ?? Thank you in advance. Yes, they are identical dimensions in terms of case, bracelet, bezel, etc. The only difference is the date (and the things that revolve around that). I’m a first time Rolex Sub owner, having just scored a very good deal on a 2001 “16620” model. Can you please tell me what differs between this one and the 16610? They’re both date indicators, right?